Historically, Mobile World Congress isn’t the place where iOS gamers go to get the lowdown on what they’re going to be itching to buy soon. Full of more Android phones than any sane person would ever want to look at as well as all kinds of things far too technical for us, iOS gaming doesn’t tend to be on the agenda. Thanks to Mad Katz though, 2014 is a little different. 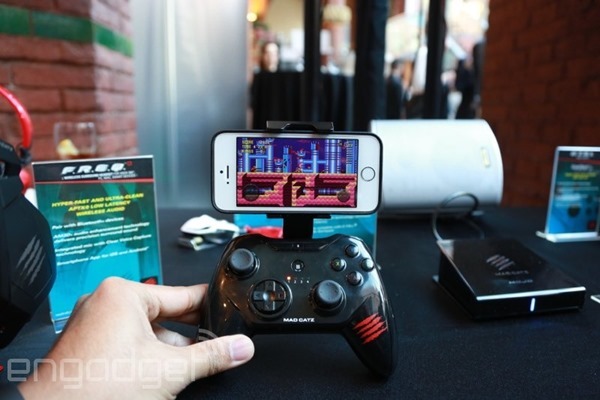 With iOS 7’s improved support for gaming controllers it seems that everyone and his dog is launching something that they claim will make gaming on an iOS device a pleasure. Ridding us of touch-based controls in games that simply don’t warrant them, controllers have the potential to take gaming on iOS to the next level, especially with iPads and iPhones consistently receiving huge speed and graphical bumps with every new release. But unfortunately nobody has managed to make a good one yet. Thankfully, Mad Katz has joined in during this year’s Mobile World Congress, and we think they might just have hit the jackpot. 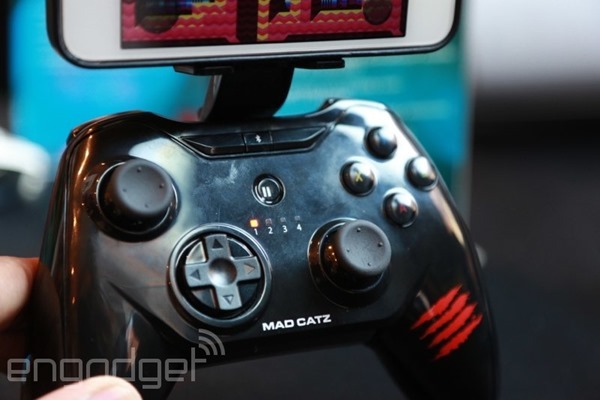 Engadget got a hands-on with the Mad Katz C.T.R.L.i Bluetooth controller and we have to say, it looks very good indeed. Essentially a repurposed Mad Katz Xbox 360 controller, the C.T.R.L.i features a removable holder that can house an iPhone in just the right place above the controller, making gaming on smaller devices a breeze. The fact that this can be removed though means that gaming on an iPad is also possible, and with Bluetooth connectivity rather than a Lightning cable, everything can keep charging during the inevitable marathon GTA gaming sessions that will follow. Being an Xbox 360 pad at heart, the C.T.R.L.i will feel instantly familiar and more importantly, won’t feel cramped. Dual analog sticks have us particularly excited too, but we’ll obviously have to reserve full judgment until the thing’s available outside MWC 2014. Currently shipping iOS controllers don’t tend to be cheap either, but at $80 the C.T.R.L.i isn’t too harshly priced, especially compared to the competition. Mat Katz says the accessory will be available in early spring, and we really can’t wait! If you want something a bit subtle, and something that is available immediately, then check out the Logitech PowerShell or the MOGA Ace Power 2. Both are great accessories and feel really great.